How do you choose the right type of equity funding for your business? This will depend on many factors, and it isn’t always exactly clear to entrepreneurs which option is right for them. Right off the bat, we asked our panellists the generic question which was on everybody’s mind: how should businesses choose which option is right for them? - Crowdfunding, VCs, Angles – “I say try them all, and see who is interested” – begins Colin. The first thing which businesses should be looking to do is to network like mad: look for introducers, look through your contacts, talk to everybody you know, and tell them you’re fundraising – you never know, they may just want to invest in your business, if only as family/friends – but this will certainly start making some introductions for you. - “If going to VCs, they will want to see a pretty big market, and what your ambitions are to grow in this market” – offers Stan. - If you are trying to establish yourself globally and reach a certain profitability scale (and you think it may be very difficult to protect your IP or protect your market share) – that’s when you might want to consider VCs, to give you the capital runway to really grow your business quickly. - Crowdfunding however, has the added bonus of marketing your product or service, to really put yourself out there to the wider public. - When thinking about crowdfunding, entrepreneurs need to keep in mind the administrative and legal burden that comes with managing 300 investors. - BAs can make investment decisions quickly but will still need to see that you have a good business plan before they commit. Many specialise in particular industries, making them a potentially valuable source of expert knowledge and even mentoring. Everything about Crowdfunding – is it set to die or prosper? - “Crowdfunding is set to diversify” – says Dan. And it really is up to the crowdfunders themselves to keep adapting the market. - It is susceptible to certain problems; one of the aspects of early crowdfunding is high valuations. A lot of platforms are now mitigating against that with lead investment and professional investors. Also, historically, institutional investors have problems investing alongside crowdfunders because of the size of the cap. - “We’re doing larger and larger raises, we’re moving on to different things with institutions” – offers Oliver. Essentially, bigger companies are using crowdfunding as a part of larger raises – there will be more collaboration, more evolution around regulation, as well as working closer with angels or even VCs. - Crowdfunding is specific because it allows anyone to become an investor. “Anyone who thinks that crowdfunding is going to die, is of the opinion that only people who are wealthy or that run institutions can invest in small business” – points out Scott. Companies like Seedrs or Crowdcube allow for investments as small as £10 – and the implications of this are huge! - ICOs are getting more traction; this is essentially crowdfunding (just with a new asset class) and is an example of evolution in the area. Who decides the value of a business and why should we trust Angels/VCs to give us a good deal? - “Valuation is really in the eye of the beholder”, says Colin. Most Angels and VCs will not be interested in taking the majority of your equity – they do not want to run your business. They want to have multiple investments – they need the entrepreneur to be highly motivated to build and drive the business, and if they lose ownership, this incentive is taken away. It has to be an alliance. - In terms of angel investing, an advantage offered by crowdfunding platforms is that you can’t negotiate terms. It’s an easy way to address angels that might otherwise be difficult, wanting to take you for a little more than you’d like. How do we get the right angel; how do we know that we’re not going to end up with somebody who’s got cash, but who’s going to make our life hell? - The most important thing is to do exactly what the investor does: interview them. - You need to do your due diligence: what companies have they invested in before, what relationships have they had? You’re absolutely well within your rights to ask these types of questions, and you should. 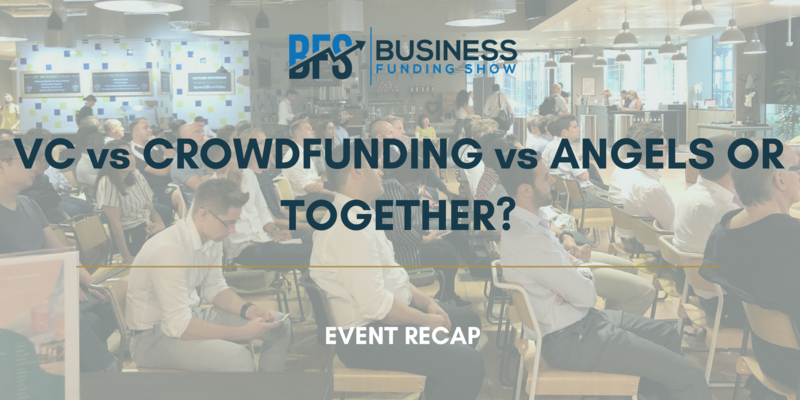 Is there a resistance from VCs towards businesses that have been previously crowdfunded? - “Not at all”, says Manish. It really depends on the quality of the business itself. In fact Crowdcube has been funded by VC firms in the past, raising over £1m in this way. - The team is absolutely key: these are the people who will bring your business idea to life, and they have to be absolutely capable of doing so. - Taking advantage of a big opportunity: doing something really different, where there’s a big proven need for it in the market. - Fair valuations, fair terms. - You need to be able to communicate your business idea in 2-3 sentences. This sounds basic, but many entrepreneurs forget it. - Hussle for your life the entire campaign: don’t stop even if you’re on 90%. - You’ve got to have passion, enthusiasm and body language when pitching – fundraising is a sales job, so you have to be a great salesman. - If going with VCs, who are looking for 10x return on investment, you have to come with a really big opportunity. - Take advantage of accelerator programmes. If you’re struggling to raise funds, or are just very early in your process, you will learn so much from an accelerator. - Be flexible: you need to be able to build your business as the situation demands – this is a quality which investors look for. As a business you need to be able to firstly know your own needs. Secondly, you need to be prepared to carry out masses of research and due diligence into your potential investors, to really understand their requirements, their history, previous relationships and investments, so that you can decipher whether or not they are the right match for you. Don’t get pushed into signing a deal which you think isn’t fair – stand your ground and know the worth of your business. If you follow these rules, work hard to achieve what you set out, make the right connections and sell yourself and your idea – you might just be able to secure the funding you have been after! Our next event ‘Networking with Funders’ is going to take place on the 21stof August (18:00-20:30) at WeWork Moorgate. If you would like to find out more/book tickets, please click here.